At first glance, you see a father standing in a field with his son, but there is so much more. Placing his arm tenderly over the shoulder of his son, the father acts as a mentor. 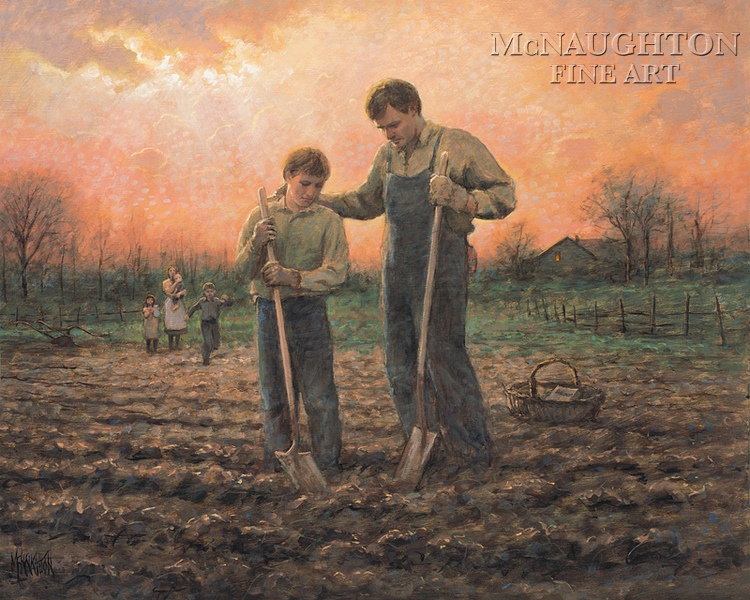 Standing together in the field, the son humbly listens to his father. Their heads are bowed as if in prayer. Looking further into the distance, you can see a mother holding her infant son. The daughter brings a pitcher of water, and the younger son runs eagerly to his father across the field. But most importantly, far off in the distance, there a symbolic element of the divine, as sunlight breaks through the clouds, flooding the sky with a soft warm light. For me, this light represents God . hand in our lives; particularly in the development of our children. He is the one who truly plants ;seeds of greatness, when he places these children in our homes.